All six MiG-29 fighter jets, which Russia is delivering to Serbia as a part of a Russian military aid package, has been completed on October 6, 2017. In December 2016, then-Serbian Prime Minister Aleksandar Vucic announced that Belgrade would receive six Mikoyan MiG-29 fighter jets, as well as 30 T-72S tanks and 30 BRDM-2 armored scout vehicles, as part of a package. The MiGs are being provided by Moscow at no charge, but their assembly, repair, and refurbishing costs are expected to near $235 million in total. After the modernization, the aircraft would begin service as part of the country's 204th Air Brigade by 2018. Reportedly, the aircraft will be upgraded to the SMT standard, a multirole variant that, along with the N010M Zhuk–M radar it features a big 950-litre spine CFT (Conformal Fuel Tank), an in-flight refueling system, a “Glass Cockpit” and a IKSh-1M HUD (Head-Up Display). 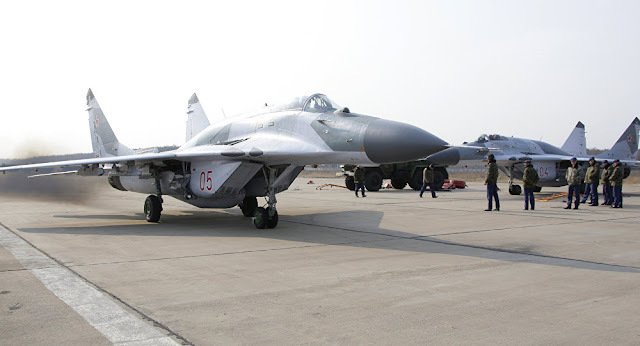 Along with the R-27T medium-range IR-guided air-to-air missiles or the extended-range R-27ER/ET AAMs, or up to six RVV-AE AAMs, the MiG-29SMT can carry “Dumb” or guided air-to-surface weapons including two Kh-29T/L, up to four Kh-25M, or two Kh-31A7P missiles, or up to four KAB-500 guided bombs. Serbian Defense Minister Aleksandar Vulin announced several days ago that the MiG-29s will be unveiled at Batajnica on October 20, 2017, as part of the celebration to mark the anniversary of the liberation of Belgrade in World War II.